Explorer’s map specialists continue to work with the charity Friend’s of Cancer Patients to map the route of their Pink Caravan Ride for breast cancer awareness. The customised UAE mini map enables patients to follow the hundreds of horse riders and mobile medical clinics which tour the country offering early-detection examinations to women in all seven emirates, including remote areas. Explorer also created route-specific shareable graphics to promote the event across social media. 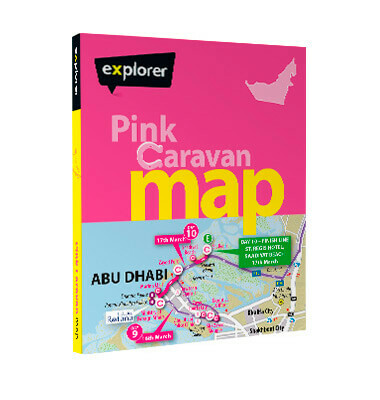 Designed in bright pink in alignment with the charity’s colours, the sophisticated map shows the country in detail, depicting an overview of the Emirates, the complex road network, area names, significant landmarks, attractions and new developments. Using satellite imagery, definitive icons and bold legends, this special map pinpoints the UAE’s major hospitals, parks, hotels, beaches, entertainment and much more.